OPTIONAL WORKSHOPS: We’re excited to offer our guests three special Workshops this week. The first one is called Becoming Supernatural, the second one is the Yoga Nidra, and the third Creating From a Vision of the Future. Please see below for more information and pricing. I teach in a way that encourages students into a state of feeling and connection with the self. When we connect to our spirit, we transcend stress, tension, anxiety and confusion. In the moment, we glimpse our essential selves and our connection to all living things. As we heal individually, we heal the collective. This retreat will focus on the power of the subconscious mind. When we are able to go deep within our implicit memories to discover the roots of our beliefs and behaviors, we can literally reprogram ourselves to behave, think, and be in ways that are more in line with our consciously created dreams, visions, and aspirations. A series of three workshops that build upon each other offers an opportunity for deep personal growth. These three workshops build upon each other. They can be taken individually, but their power will be compounded if you take them in sequence. The price is $40 each, or $100 for all three. A 60-minute process designed to open the sub-conscious mind, dissolve duality, and experience pure consciousness. Beginning with breathwork to activate the pineal gland, we will transition into a 35-minute guided meditation, followed by guided writing process. Designed to prepare you for the following processes, but can be experienced alone as complete practice. If you’re not creating from a vision of the future, you are creating from the memories of the past. This 75-minute workshop starts with shamanic breathwork and a guided meditation to release the past, followed by guided writing process and life design and finishes with a 30-minute guided meditation to literally install your new vision into your neural network. This is a powerful energetic process which may bring up a lot of emotion, but will give you exceptional clarity to see the life you most deeply want to life. Based on the work of Dr. Joe Dispenza. This 60-minute experience of “yogic sleep” will revitalize you, refresh you, and further install the vision of your future into your subconscious mind. 1 hour of yoga nidra is equivalent to 4 hours of deep sleep. During yoga nidra, you are gently guided into a very deep state of relaxation during which you are awake, but your brain and body enter the wavelengths of sleep. The subconscious mind is very receptive in this state. During the yoga nidra, you will practice auto-suggestion, a form of hypnosis, by repeating phrases of your choice that align with your vision. Yoga Nidra is an effective way to heal the body and mind from stress. It is a form of very deep meditation during which new ideas and behaviors can be imprinted into the subconscious mind. Optional meditation offered daily prior to morning yoga sessions (6:45am; included). 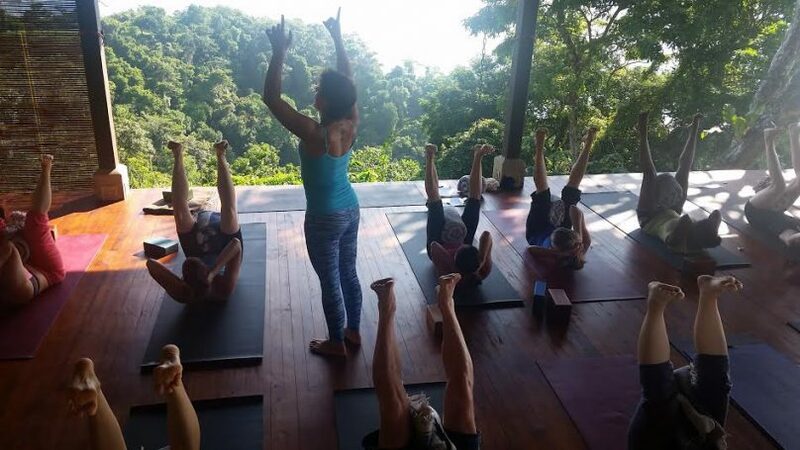 Optional sunrise yoga class offered on the morning of departure Saturday ($25; pre-registration required).